<p>Diane Lofgren (’77, ’80) accepted her first serious reporting assignment while she was still a high school student. She and a friend were hired by her friend’s father, the founder and president of emergency care product company Dyna Med, to interview firefighters and paramedics for the company’s publication, Emergency magazine. The two traveled by Greyhound bus, stopping at firehouses along the way, to ask how the professionals used Dyna Med’s products. She later became senior editor of Emergency. <p>After earning her bachelor’s degree in journalism, Diane and another friend embarked on a trip to New York to interview 100 magazine editors for insider writing and publishing tips for their 1986 book, “Get Published: Top Editors Tell You How,” which was published in hardback and paperback by Henry Holt & Company. <p>These early experiences stoked Lofgren’s interest in journalism. She went on to major in the discipline at San Diego State University and returned to New York for a summer internship at Good Housekeeping magazine through the Magazine Publishers Association. She would later earn a master’s degree in communication with a specialization in mass communication and media studies at SDSU. <p>Through it all, Lofgren worked hard to finance her education. She understands the difficulty of living on a strict budget. That’s why, when she and her husband decided to make a gift to SDSU, they opted to support students with financial need. The Diane Gage Lofgren Endowed Scholarship for Journalism benefits students in the School of Journalism and Media Studies, which includes majors in advertising, journalism, media studies and public relations. <p>Lofgren set up a public relations agency in San Diego after graduating. With clients like Scripps Health, Mercy Healthcare and Mission Park Medical Clinic, she gradually learned about the healthcare industry. In 1994, Sharp HealthCare headhunted Lofgren for the post of vice president of corporate communication. <p>During a career of nearly 35 years, she also worked for Catholic Health Initiatives and Kaiser Permanente. 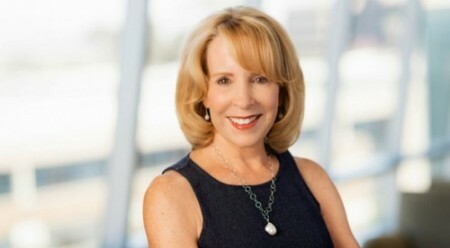 Lofgren retired in 2017 as chief marketing officer and senior vice president for Sharp, where she and her team created a customer and social media engagement center that allowed the company and its expert medical staff to respond quickly to trending topics. She and her team also created an online newsroom with two new stories a day quoting Sharp HealthCare physicians and other experts that serves as a source for health and medical stories for local media. <p>Lofgren is a fellow of the Public Relations Society of America; was named PR Leader of the Year in 2010; and is a member of the Arthur W. Page Society, a by-invitation-only professional organization for chief communications officers of Fortune 500 companies and leading nonprofit organizations. Lofgren is also the author of ten nonfiction books, including “Women I Want to Grow Old With,” published in 2011. <p>Despite her busy life, Lofgren never lost touch with SDSU. She often returned to campus as a guest lecturer and invited SDSU faculty to lead classes at Sharp. <p>Now that she and her husband, engineer Matt Lofgren, are semi-retired, they split their time between San Diego and West Virginia. Both are pursuing second careers writing screenplays. Matt’s first attempt was made into the film “Ghost Boat,” which he wrote and directed.